Home / Parking Matters Blog / What do Apple, Amazon, Johnson & Johnson, Tesla, Cisco, Siemens, and Uber Have in Common? What do Apple, Amazon, Johnson & Johnson, Tesla, Cisco, Siemens, and Uber Have in Common? Ever find yourself in a career rut? You go to work, you accomplish the task, you meet the budget goals, but are you passionate about your industry? I’ve read the articles that talk about Google being the best place to work. They elaborate on the creative workspace and corporate mission that encourages collaboration and outside-the-box thinking–not to mention the amenities. I think about the energy inside those four walls (well, not really four walls in the case of Google) and companies that are so visible and seen as one of the leaders in their space, and where employees have been given free rein to break the mold and re-imagine their position in the world every day. Apple is the same. Can you imagine the job satisfaction factor working in an industry where technology is catapulting you into visibility and where you have a front-row driver’s seat? Now’s that invigorating! As a professional in this industry, if you’ve questioned or daydreamed about making a career change, don’t go anywhere just yet! 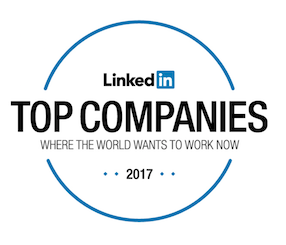 I stumbled upon this article “LinkedIn: Top Companies Where the World Wants to Work Now ” and I am fascinated and inspired. Technology is changing the way people function and view mobility. Self-driving cars, ride-share vehicles, sustainable transportation, data analysis, electric-car charging stations, solar-power storage, and management systems permeate through the list of top 25 companies.